I still remember it like it was yesterday. I was a teenage boy in 1984 perusing the twenty or so television channels and stumbled upon the then fledgling MTV. That’s when I first saw the video for “I Can’t Hold Back”. It was the first single from Survivor’s Vital Signs album and the first time I ever heard Jimi Jamison, a man I proclaim has the best voice in rock. I begged my parents to buy me that record. The very first one I ever purchased. One I subsequently wore out and to this day now adorns a spot prominently on my office wall. I’ve been an avid follower of Jimi’s career ever since. From Survivor to Baywatch to Empires and pretty much everything in between. Every song bringing me back to those carefree days of youth. I still remember walking to class on my college campus blasting “Desperate Dreams” and “Didn’t Know It Was Love” from Survivor’s “Too Hot To Sleep” album on my Sony Walkman, a brick compared to what’s available these days. Similarly, Bobby Kimball’s vocals abound all over my youth. From Toto’s biggest hits including “Hold The Line” and “Rosanna”, his vocals also hold a special place in my own personal musical journey. 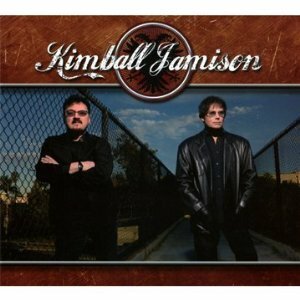 Combine these two forces together and you get Kimball-Jamison, a Mat Sinner produced album featuring twelve new tracks from two of the greatest vocalists in rock. From the soaring vocals and guitars of the intro Worth Fighting For to the angelic sound of Your Photograph, this CD has everything the melodic rock fan could want. I have to say that there’s really something special when you listen to this record. Something that I’ve found to have previously been lacking in music that’s synthetically released to the masses these days: great songwriting and musicianship. In a world where the robot voice and auto-tune has become the norm it’s refreshing to hear true vocalists do what they do best: sing great songs. Any fan of 70’s and 80’s bands can appreciate the influences on this record. Forget Kevin Bacon. Within one degree of Kimball-Jamison you get contributions from: Ides of March, Survivor, Toto, Mister-Mister, Cobra, The Baby’s, Bad English and more. Included with the CD is a DVD containing a thirty minute “making of” documentary as well as video clips for the songs Worth Fighting For and Can’t Wait For Love. You may not find me trolling college campuses these days but this album will surely find a place on my i-Pod. And if you’re a fan of melodic rock like I am, I suggest it be on yours as well.